HIPPOKAMPOI (Hippocamps) were the fish-tailed horses of the sea. 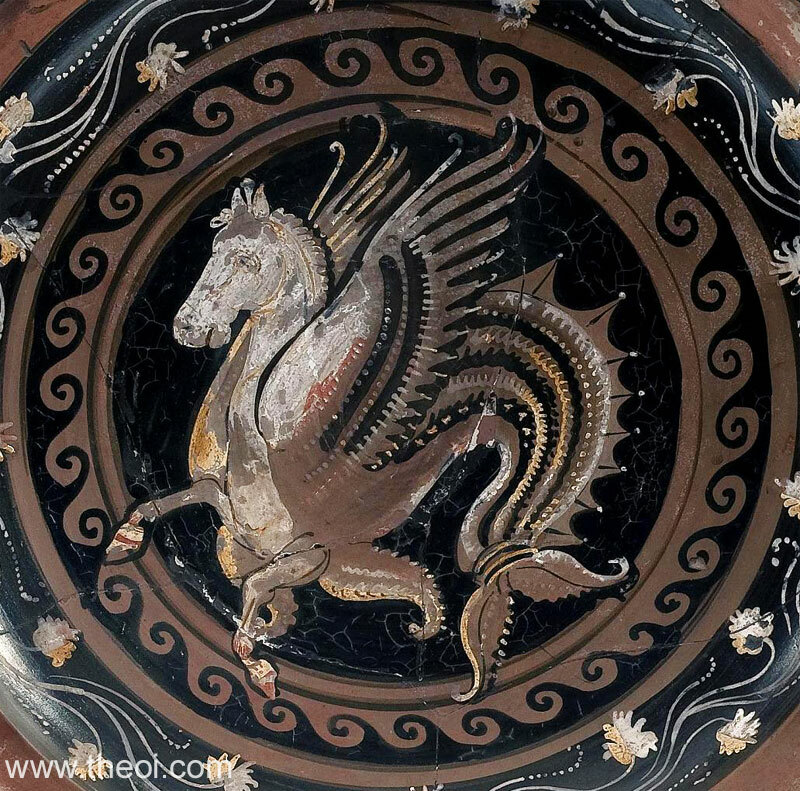 They were depicted as composite creatures with the head and fore-parts of a horse and the serpentine-tail of a fish. In mosaic art they were often had green scales and fish-fin manes and appendages. The ancients believed they were the adult-form of the small fish we call the "sea-horse". Hippokampoi were the mounts of Nereid nymphs and sea-gods, and Poseidon drove a chariot drawn by two or four of the creatures. Other fish-tailed land animals which appear in ancient art include the "Leokampos" (fish-tailed lion), "Taurokampos" (fish-tailed bull), "Pardalokampos" (fish-tailed leopard), and "Aigikampos" (fish-tailed goat). The last was the form of the constellation Capricorn. Fabulous creatures of this type were believed to be common in the Indian Ocean (see Ketea Indikoi). "The sea was raised by an earthquake and it submerged Helike (Helice) [in Akhaia (Achaea)], and also the temple of Poseidon Helikonios (of Helike) . . . And Eratosthenes [C3rd B.C. poet] says that he himself saw the place, and that the ferrymen say that there was a bronze Poseidon in the strait, standing erect, holding a Hippokampos (Hippocamp) in his hand, which was perilous for those who fished with nets." "[In the temple of Poseidon in Korinthos (Corinth) :] The other offerings are images of Galene (Calm) and of Thalassa (Sea) and a horse like a whale (ketos) from the breast onwards [i.e. a Hippokampos (Hippocamp)]." 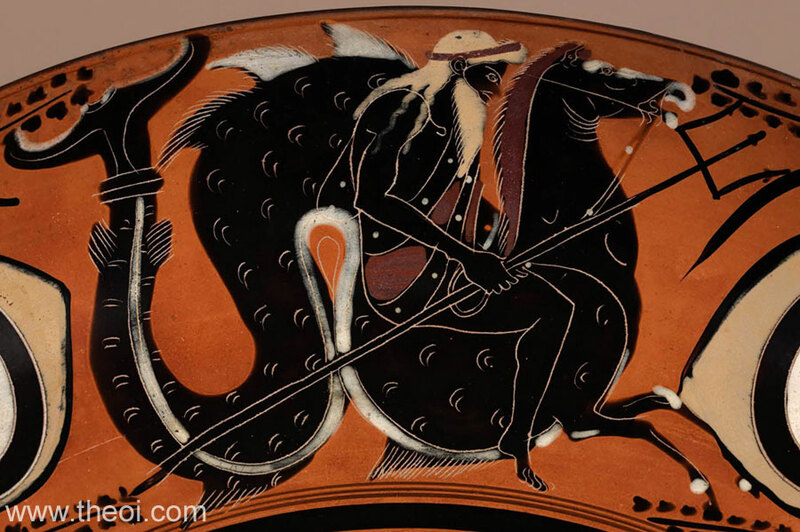 "[From a description of an ancient Greek painting in Neapolis (Naples) :] Poseidon's journey over the sea I think you have come upon in Homer, when he sets forth from Aigai (Aegae) to join the Akhaians (Achaeans), and the sea is calm, escorting him with its Sea Horses and its Ketea (Cetea, Sea-Monsters); for in Homer they follow Poseidon and fawn upon him as they do here in the painting. There, I imagine, your thought is of dry-land horses--for Homer maintains that they are ‘bronze-hoofed,’ ‘swiftly-flying,’ and ‘smitten by the lash’--but here it is Hippokampoi (Hippocamps) that draw the chariot, creatures with web-footed hoofs, good swimmers, blue-eyed, and, by Zeus, in all respects like dolphins." "Orion when grasping his father's [Neptune-Poseidon's] reins he heaves the sea with the snorting of his two-hooved horses [Hippokampoi (Hippocamps)]." "There [at Cape Tainaros (Taenarum) at the southern end of the Peloponnese] Neptunus [Poseidon] brings hom to haven his coursers wearied by the Aegean flood; in front their hooves paw the sand, behind, they end in fishy tails beneath the water." "He [Poseidon] towers on high above the peaceful waves, urging his team [of Hippokampoi (Hippocamps)] with his three-pronged spear: frontwise they run at furious speed amid showers of foam, behind they swim and blot out their footprints with their tails." Greco-Roman Ephesus Floor Mosaic A.D.
Greco-Roman Sousse Floor Mosaic C3rd A.D.
Greco-Roman Ostia Floor Mosaic C2nd A.D.
Greek Eretria Floor Mosaic C1st B.C. Greco-Roman Chebba Mosaic C2nd A.D.